About this object This 1861 artist rendition of the new Capitol Dome depicted a pedestrian balcony that was not part of the final construction. Republicans kept control of the 39th Congress (1865–1867), and Abraham Lincoln went back to the White House following the 1864 elections. Lincoln’s assassination in April 1865, however, elevated Andrew Johnson to the presidency. 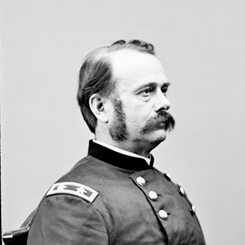 Johnson took control of the South’s reconstruction, freely issued pardons to former Confederates, and backed the new segregated state governments. Congress quickly circumvented Johnson's authority and passed the First Reconstruction Act, which put the South under military rule. It also designed an Army hierarchy independent of the President and passed the Tenure of Office Act, which required the Senate to approve the removal of executive officials. 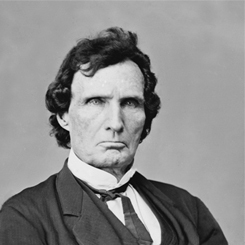 Representative Thaddeus Stevens of Pennsylvania opened the 39th Congress (1865–1867) by introducing a resolution to create a Joint Committee on Reconstruction. 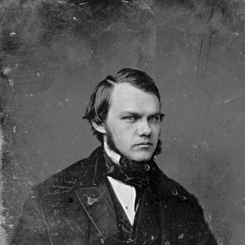 The House overrode President Andrew Johnson’s veto of the Civil Rights Bill of 1866 with near unanimous Republican support, 122 to 41, marking the first time Congress legislated upon civil rights. Representative Lovell H. Rousseau of Kentucky assaulted Josiah B. Grinnell of Iowa in the East Front House portico.